There has been a lot of hype surrounding Pokémon Go lately and also speculation around the source of the map data they are using. It should be no surprise that we, map data geeks from Spatineo, just could not stay away from doing our own little investigation of the maps they’re using. Most of you probably have already heard what the game is about, so we’ll just summarize the idea behind the game: Pokémon Go is a mobile augmented reality game where players use their smartphones to catch virtual Pokémon creatures that can be found in real world places. In case you’ve been a little disconnected from the outside world lately and haven’t heard about the game, just check out their video to see how it works.The game relies heavily on maps to not only show the location of the user, but also to show where you can find Pokémon, Gyms, etc. This data covers most of the world and is quite a remarkable data collection in itself, that is why the source of this map data has become a topic of several recent media articles. 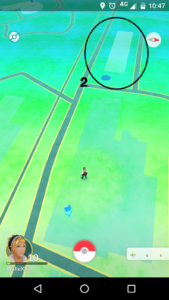 An article in The Atlantic was questioning whether the spatial data used in the game comes from the OpenStreetMap or Google Maps, and creators of the game from Niantic declined to disclose this information. So we thought, why wouldn’t we try to figure it out ourselves? We took screenshots of a particular location (in Espoo, Finland) in the game as well as in Google Maps and OpenStreetMap. (Yes, our fellow Finns, while the game isn’t released here yet, we were lucky enough to find a friend who had downloaded the game from a foreign App Store). Just compare the path in Pokemon Go (circle 1) with the screenshots from Google Maps and OpenStreetMap. 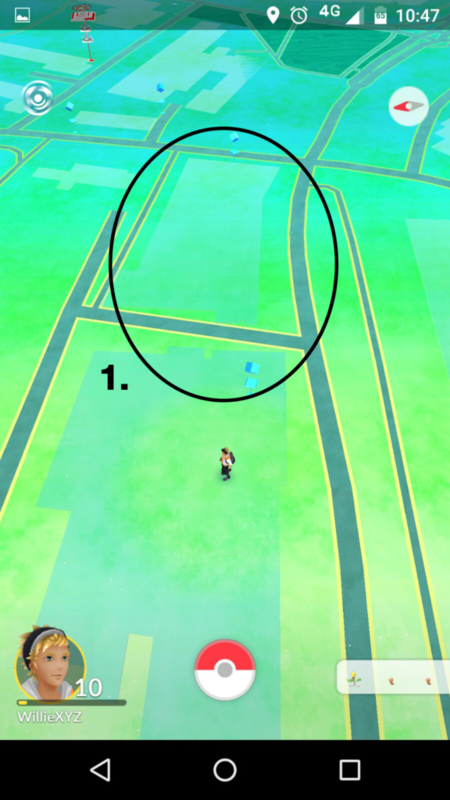 The features in Google Maps and Pokemon Go are identical whereas the turn appearing on OpenStreetMap is missing from the game. 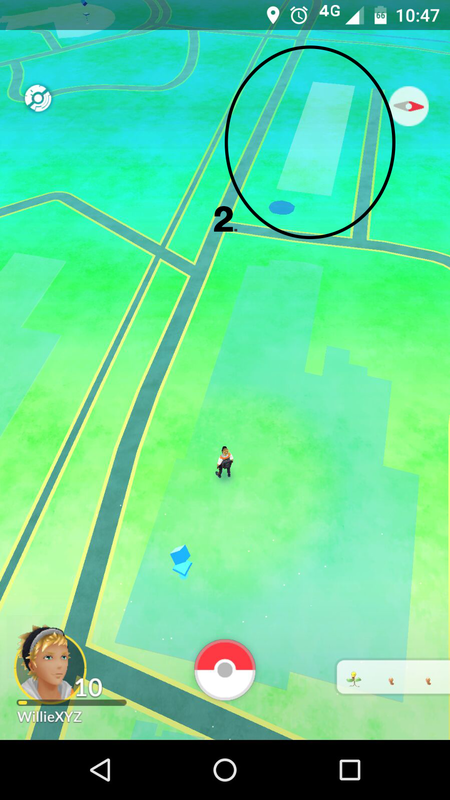 Now take a look at the building on this screenshot from the game (circle 2) and compare its’ shape on the Google Map and the OpenStreetMap. OpenStreetMap is clearly more detailed, but all this detail is missing from the game. These images strongly suggest that Pokémon Go uses Google maps as its basemap. On the other hand, Google Maps outsources most of their map data, which makes it at least theoretically possible that Niantic is just using the same original source instead of Google Maps. However, given the fact that Ingress, Niantic’s original map and location based augmented reality game, was developed under Google’s wing, and that Niantic was spun off only as recently as September 2015, it’s safe to assume they might still have a working relationship when it comes to maps. Given all this information, we think we can call it: Pokémon Go uses Google Maps. Please let us know if you have information otherwise and we can continue our Pokémon hunt.. er.. investigation. Why are we so excited about Pokémon Go? Not only does the game encourage people to get active and explore their surroundings, but it also utilizes map data in a very innovative ways. There is much more to the game’s maps than just the the typical street maps we’re accustomed to. 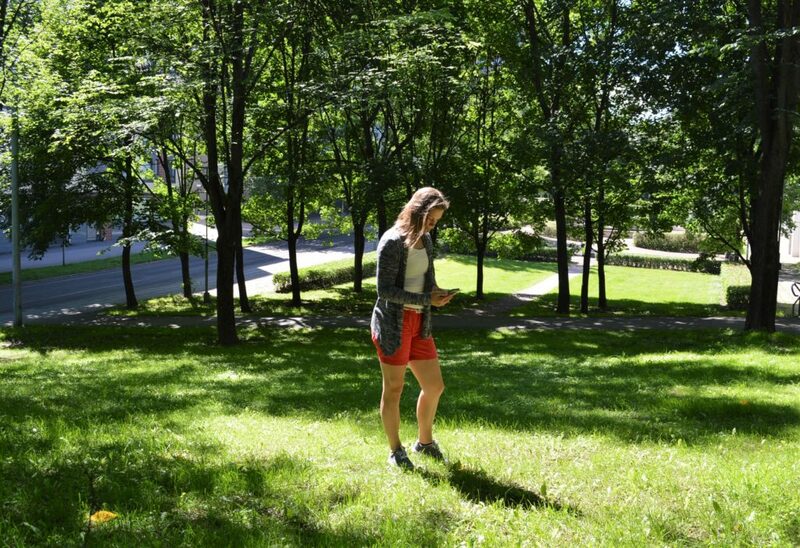 Pokémon Go is backed by a large amount of data gathered from different sources like geology, vegetation and hydrology. Creators of Pokémon Go have put a lot of effort into using data to give context for the different scenarios the players will encounter. For instance you’ll meet water-type pokémons only next to the actual water features (lakes, ponds, fountains, etc). “That gets into more [geographic information system]-type of data … and we utilise that to map Pokémon species to appropriate habitats,” John Hanke, CEO and founder of Niantic, told Mashable. They might have even used Spatineo Directory as one of their sources, since the Directory has the most comprehensive listing of geographical data in the world and is open for all to browse. What does a happy marriage between map data and gaming lead to? Well, so far so good – shares of Nintendo, which owns 33% of the Pokémon company and has a stake in Niantic, rose 53% in the three trading days after the release. Meanwhile both traditional and Social Media is going crazy about the game, as well as most of your friends (probably). To sum up, what Pokémon Go actually does, in addition to being a highly addictive game, is get people interested in maps and spatial data. This kind of game wouldn’t be possible without up-to-date and highly available public maps. With services like Uber and Tripadvisor, using real-time map data has become a part of our everyday lives without us even realizing it. Now GIS and maps are invading our games as well! Edit: In December 2017, Niantic finally made the change that all map data in the game would be coming from OpenStreetMap, not Google Maps. Read more about it here! There is a clear picutre of the side of that building (a mural) used in the game. Neither Google Maps nor OpenStreetMaps mark that building in any particular way, plus it’s blurred in StreetView. I thought the information would come from Foursquare initially, but they’ve some Pokéstops etc that are not based at Foursquare venues. Possibly from a layer of 4sq data that isn’t live on their app (previously deleted/merged venues)?? Anyone else know anything, I’m really keen to understand this. They got all the landmarks through player submitted photos and gps coordinates through a game released a couple years ago called Ingress. It is also by Niantic. I wonder if Niantic is reusing the Ingress Portal locations as landmarks in Pokémon Go? It would make perfect sense to me. The ellipse in the Pokemon map is due to the viewing aspect. It is not a perfect circle because it isn’t a map generated from a perspective that is directly overhead. If it were an ellipse from a perpendicular aspect, then it would be a projection issue, or a geographic statistical analysis (ie. standard deviational ellipse in UTM) was performed. In this case, it is purely viewing aspect. Niantic seem to have moved to Openstreetmap data. Today the parking lot in Hermia had all roads mapped in PoGo, yesterday it was still an open green area. Also the at least the 0.83.3 app mentions Openstreetmap map data on the license page.